Metal recycling in Chicago has a number of advantages. Not only does it benefit the environment, it benefits the economy as well, driving down the prices of metal goods. This is why, if you have metal items that you’re trying to get rid of, it’s wise to have them recycled. Perhaps you have old brass items that you’re thinking about recycling? Maybe you’re wondering if these items are even able to be recycled? If so, the following list might be helpful to you. Here are some of the most commonly recycled brass items. Do you have any old door locks being stored in your house or garage? If so, it’s possible they are made out of brass. Along with stainless steel, brass is often used in in a variety of commercial and residential door locks. In most cases, when recycled, brass locks will be melted down so that they can be used for other applications. A wide variety of plumbing fixtures are made out of brass. These include everything from shower heads, to faucets, to hose attachments, and much more. If you have some old brass plumbing fixtures in your possession, you might want to consider recycling them. Like brass locks, brass plumbing fixtures are typically melted down and used to manufacture other types of products. 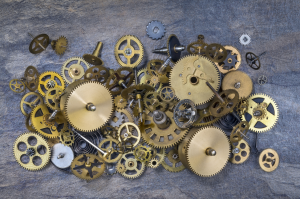 Often times made out of bronze, mechanical gears are used in a number of different products. These products include many types of watches, manufacturing machines, toys, appliances, and a variety of other entities. If you own any old and worn out versions of these items, you could very well have recyclable gears in your possession. Again, when recycled, brass gears are generally melted down and used to produce entirely new products. As you might know, there is an entire family of brass instruments. These instruments include the trombone, the trumpet, the French horn, and the tuba, just to name a few. If you have such an instrument in your possession, and you no longer play it, you might be best served by recycling it. There are many organizations that will accept used brass instruments as they are. However, if you’d rather have them melted down and used for other purposes, there are a number of Chicago recycling centers that will accept them in exchange for cash. An additional component of your plumbing system that could very well be made out of brass is your pressure valve. Pressure valves can be made out of plastic, aluminum, and brass, but brass valves are the most common. If you have any old plumbing fixtures laying around the house, spare brass could very well be in your possession. Like most other brass materials, pressure valves can be turned into a liquid, and then reformed to manufacture new items. Looking to Recycle Brass in Chicago? Do you have some old brass items that you are trying to get off your hands? Looking to recycle brass in Chicago? If so, we here at Central Metal Recycling are the people to see. We pay good money for recyclable brass, taking it directly off of your hands while paying you top dollar in exchange. Our friendly team of recycling specialists would be happy to work with you.